St. Polycarp was the Bishop of Smyrna (modern Izmir, Turkey) in the 2nd century. It is believed that he was consecrated to the episcopate by St. John the Apostle. This account is recounted by Church Historian and Theologian St. Jerome. 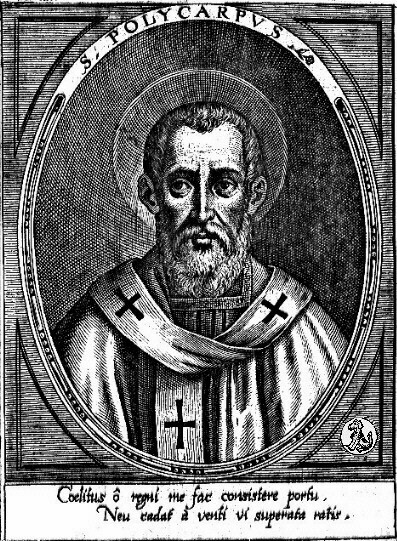 As bishop, St. Polycarp served churches in Philippi. St. Polycarp is also known as one of the three Apostolic Fathers; alongside Clement of Rome and Ignatius of Antioch. He served during a time in which Christianity was at its infancy, and subjected to much persecution. St. Polycarp was captured and martyred. The first attempt was being burned at the stake, however, miraculously, the flames did not touch the Bishop. The final, and fatal attempt was a stab with a dagger. St. Polycarp is revered in the Roman, Orthodox, Anglican, and Lutheran Churches. His example as a Bishop during the 2nd century is nothing short of inspirational. He served his people faithfully, until death. It is quite evident that God showed favor unto him via the miracle of the flames at his execution. St. Polycarp is interesting because of his being so close to the New Testament writers, but not having any text included in the Biblical New Testament Canon. He, St. Ignatius of Antioch, and St. Clement of Rome are given the honorific title of the Apostolic Fathers for that reason. It causes food for thought for me to see the amount of things St. Polycarp has done, and how relatively unknown he is outside of theological circles. Perhaps that is a lesson to all of us. It’s not about the fame, but the work. It’s not about the position, but the work, and the faith it takes to serve in the position.